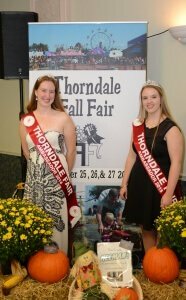 Thorndale Agricultural Society invites all young males and females residing in the Thorndale Fair area to enter the Thorndale Fair Ambassador Competition. The selected Fair Ambassador will spend 1 year representing the Thorndale Agricultural Society at various events and attend leadership training opportunities including two overnight trips to Toronto. They will receive $1000 presented at the Annual Meeting. All other participants will receive $100. Ambassador roses are sponsored by Triple D Farms, The Duffin Family. Contestants must be 17-22 years old of August 1, 2018. Interested applicants must contact Laura Langford at lj.langford@gmail.com to receive an application to be completed and returned prior to September 15, 2018. Contestants will be judged on their community knowledge and involvement, knowledge of agriculture, personality and presentation. There will be a personal interview with a panel of judges. Judging and interviews will take place on the evening of Friday, September 21, 2018 beginning at 5:30 p.m. and will continue throughout the evening ceremonies. The selected Ambassador is expected to be available to represent the Thorndale Agricultural Society on the three (3) days of the fair, including the Saturday morning parade. Activities will be assigned throughout the weekend to participate in. The selected Thorndale Fall Fair Ambassador will be expected to represent the Thorndale Agricultural Society throughout the year at various community events, the District Meeting in November, the O.A.A.S. Convention Ambassador Leadership Program in Toronto from February 14-16, 2019, and the C.N.E. Ambassador of the Fairs Leadership Program from August 16-18, 2019. Members of the community are encouraged to contact the Ambassador Committee: Lauren Hartwick, Norma Poel, Laura Langford, Emily McClocklin, Melanie Harris, or Bridget Heeman to recommend participants for this year’s Ambassador Competition.